Marriage Officers are normally ministers of religion, or lay-pastors. They will conduct a religious ceremony according to their faith. A Civil Registrar, like I am will conduct a civil ceremony or a spiritual, contemporary ceremony. A beach in the district of Bodden Town. This is where I grew up, and I still have fond memories of this district. A Special Marriage License costs US$200 and is available from the Corporate Office of the Cayman Islands Government. Your wedding celebrant will get this for you, so there is no need for you to stand in line and wait to get this yourself. The Special Marriage License is included in all my packages. You cannot obtain a SML in advance, your signature on the application has to be witnessed on the date it is applied for, and must be accompanied by your white Immigration slip, or your ship's card as proof that you are a visitor. There are different requirements for couples who are locals, or residents of the islands. This is the famous Seven Mile Beach, often ranked in the Top Ten beaches in the world, and a favourite for a beach wedding in the Cayman Islands. Your application for a SML must state the wedding officiant, the location and date of the wedding as well as your personal details. If you have been married before these personal details will include complete details of your divorce, or your spouse's death certificate. All my weddings have a similar set-up to this, a table, with linens and usually shells and an envelope which contains the relevant paperwork to legalise your marriage. I have a particular affinity for star-fish which I think are very lucky. After the ceremony, couples are required to sign three pieces of paper. A Certified Copy of the Marriage Certificate which is theirs to keep, (this is the pretty gold one you see in many pictures) the Marriage Register and the Marriage (Duplicate) Register. The Marriage Register is my copy and is filed in my Book of Marriages. Each Marriage Register has a unique number, and my initials. The Marriage (Duplicate) Register is the official record of your marriage which I file with the Registrar General's Office, or as you know it, the "public records office". Under our Marriage Law every wedding must be witnessed by two other people over the age of 18 years. People often ask me whether family members can witness, yes, they can. If you are coming just as a couple, I can provide the witnesses but you must tell me in advance that you need them. It is appropriate to give your witnesses a tip if they have come out to your wedding especially. This couple travelling on a cruise ship found some witnesses to bring along to their Seven Mile Beach wedding. In a day or two, I obtain a Registered Marriage Certificate on your behalf which I mail to you. This is your official Marriage Certificate which you will need to change your Drivers License, change the name on your Social Security, bank accounts etc. It is VERY important, and you should safe-guard it with your other important papers. (If you lose it, you can write to me and get another one, remember I have one copy on my own marriage book). All my wedding packages include the Registered Marriage Certificate. It says "secure copy" on the reverse, it has a coloured water-mark of the Cayman Islands Coat-of-Arms and it has the raised seal of the Registrar General. I write many special ceremonies for couples both for weddings and wedding vow renewals. I particularly enjoy writing parts for children and parents of the bride and groom when appropriate. 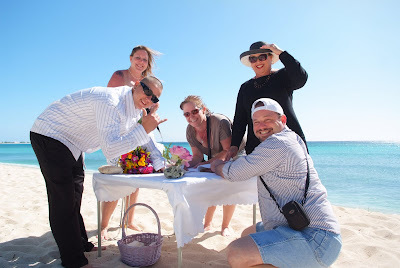 The Unity Sand Ceremony is very popular for a beach wedding. There is an extra charge for this if I provide the ceremony, sand and containers including the Memory Vase for you to take home. You can bring your own sand and Memory Vase, that's fine with me. I caution couples against using too many colours. The most popular colours are blues, greens and browns. Sometimes couples put special colours in to represent their favourite sports team. Sometimes if there are children involved I like to use small shells, small pieces of paper with wishes, or blessings anything which conveys to the child that this is a very special and unique part of the wedding ceremony. Just married couple with champagne cork with the date, and a Cayman quarter. This is a local tradition which we got from the British. The sixpence in your shoe tradition doesn't work so well on the beach where most people go barefoot for their wedding. I try to include some local traditions and Caymanian flavour in all my weddings. I have many different ceremonies, readings and vows. I can write a ceremony which reflects your own heritage, religion or customs. Please let me know when you have particularly enjoyed your Cayman Islands wedding and I will post your comments for other to share.